New Delhi: Inspired by European waste management practices, a waste management firm will install at least 100 reverse vending machines across Gurgaon, offering Re1 per plastic bottle. The move aims to promote segregation of waste and collect material for recycling. “We will install 100 reverse vending machines outside housing societies and in markets where anyone can come and deposit their pet bottles … In return of bottles, a consumer can get either freebies or cash,” said Sachin Sharma, a director at Gem Enviro Management Limited. Sharma said that the plan in Gurgaon is a pilot project and the scheme, if successful, will be replicated in other areas. Sharma said they expect the plan to click as cash and freebies would offer consumers an incentive to come and deposit their trash. “It is simple economics. A rag picker, on an average, gets around 20 paise per bottle while we would offer Re1. Hence, we hope to collect much more,” said Sharma, adding that the initiative would contribute to cleanliness drive in Gurgaon and contribute to Swachh Bharat mission. In March, the Central government notified the Plastic Waste Management (PWM) Rules 2016 to replace the Plastic Waste (Management and Handling) Rules 2011. The rules have introduced the concept of extended producer responsibility (EPR) under which producers are responsible for collecting waste generated from their products. “Individual and bulk (waste) generators like offices, commercial establishments, industries are to segregate the plastic waste at source,” according to the rules. The government is hoping to increase the overall collection of waste from across the country as responsibility of waste generators has also been introduced for the first time. The new rules have enabled scrap management firms like GEM Enviro Management Pvt Ltd to play an active role. Started in 2013, the company provides scrap management solutions, including collection, recycling and sale of recycled merchandise, to its clients. It is already working with organizations like Coca Cola, Bisleri, Pepsi, Sun Pharma, Cipla among others for their bottle waste. 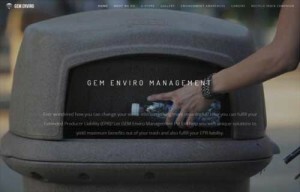 Dinesh Pareekh, another director at Gem Enviro Management Limited, said the company collects waste like plastic packaging and PET directly from factories, offices, hotels, motels and institutes. ”This would open up a new avenue for us and would also inspire citizens to segregate plastic waste which otherwise harms soil and water once it is dumped at landfills with other waste,” Pareekh said. The waste is recycled into laptop bags, T-shirts and caps and many other products. The duo also may choose to sell their products through e-commerce websites but first wants to dispel notion of recycled products of being inferior quality. “Even the jersey of Indian cricket team by Nike is made from such plastic waste,” Pareekh added.